Purchase this product now and earn 3,760 Reward Points! 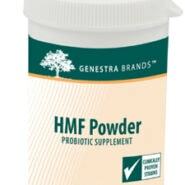 Recommended Dose: Adults and Children (1 year and older): In a glass, add water to one scoop (¼ teaspoon) of HMF Powder and mix. 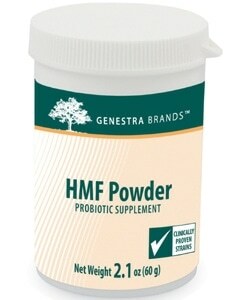 Take two times daily with meals, or as recommended by your healthcare practitioner. Risk Information: If you are experiencing nausea, fever, vomiting, bloody diarrhea or severe abdominal pain; or if you have an immunecompromised condition, do not use. If symptoms of digestive upset occur, worsen or persist beyond three days, discontinue use and consult your healthcare practitioner. Guaranteed to contain no added wheat, starch, corn, sodium, artificial coloring or flavoring or antimicrobial preservatives. Ideal for vegetarians. Quality Assurance: Safety-sealed for your protection and for product freshness. Do not use if outer seal is missing or broken. Store under refrigeration (below 46° F).